KC Comets, LLC (“COMETS”) respects the intellectual property rights of others and provides this Copyright Policy to describe COMETS’ policy of prohibiting users from uploading, posting or otherwise transmitting on or to this website or app, any websites or apps on which this DMCA policy appears, including those at www.kccomets.com URLs (collectively, the “Sites”) any information or materials that violate another party’s intellectual property rights. The Digital Millennium Copyright Act of 1998 (the “DMCA”) provides recourse for copyright owners who believe that material appearing on the Internet infringes their rights under U.S. copyright law. It is COMETS’ policy to respond to notices and counter-notices that properly conform with the DMCA’s requirements. Accordingly, notices and counter-notices must meet the then-current statutory requirements imposed by the DMCA; see the Copyright Office’s web page at www.copyright.gov for details of the current DMCA requirements. Please note that you may be liable for damages, including court costs and attorneys’ fees, if you materially misrepresent that materials on the Sites are infringing a copyright. If a counter notice is received by COMETS’ DMCA Agent, COMETS may send a copy of the counter notification to the original complaining party informing that person that COMETS may replace the removed content or cease disabling it. Unless the copyright owner files an action seeking a court order against COMETS or the user, the removed content may be replaced or access to it restored by COMETS. If you believe that a user is a repeat infringer, please follow the requirements above, but also include information or evidence that will reasonably prove to COMETS that the user is a repeat infringer. 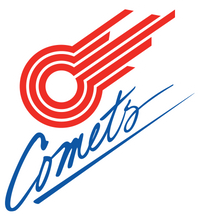 COMETS takes copyright infringement very seriously. Pursuant to the repeat infringer provision of the DMCA, Section 512(i), COMETS shall maintain a list of DMCA notices from copyright holders or on their behalf, and will make a good faith effort to identify and prohibit future posts by repeat offenders. If you provide false information to COMETS regarding any of the above notifications, counter-notifications or repeat infringer notifications, you may be subject to legal and equitable remedies. © 2017 KC Comets, LLC — All Rights Reserved.